I recently downloaded the Dreamworld Adventures Environment Art Pack and the Dream Frontiers Environment Pack. However, I need to know what the individual length and height dimensions of each tile...in particular the Jungle_Tiles_A file and the Jungle_Tiles_B file. Since the files have the tiles lined up so seamlessly, it's hard to exactly what the edges are. Could someone help me with that, please? The tiles are 512 x512 pixels. Y reduce the entire tile sheet to half size, quarter size etc for smaller size-requirements... just be sure to scale using "nearest neighbor" (no filtering) otherwise the tiles will get blurry edges and no longer tile with each other cleanly. And no worries on the delay. I didn't even have to wait a full day. If that's "too long" for me to wait, I've got issues. Second question. In the tileset files where all the platform objects are stored in one, can I safely assume that the first tile begins at the very top-left corner (0, 0)? I ask because when I separate the tiles from each other at the 512x512 dimensions, assuming a pure grid-style of the tiles as they are arranged in the file, they seem to come out oddly (I don't know how to best qualify "oddly"). platform objects? Can you give me the actual image file name so I can take a look? Yes, specifically the Jungle_Tiles_A.png file. I guess a better question to ask is: What does each individual tile look like when separated? Yes, the grid starts at zero, zero. You see how the tiles have some "perspective" on top so you can see the ground where the player and enemies would stand? 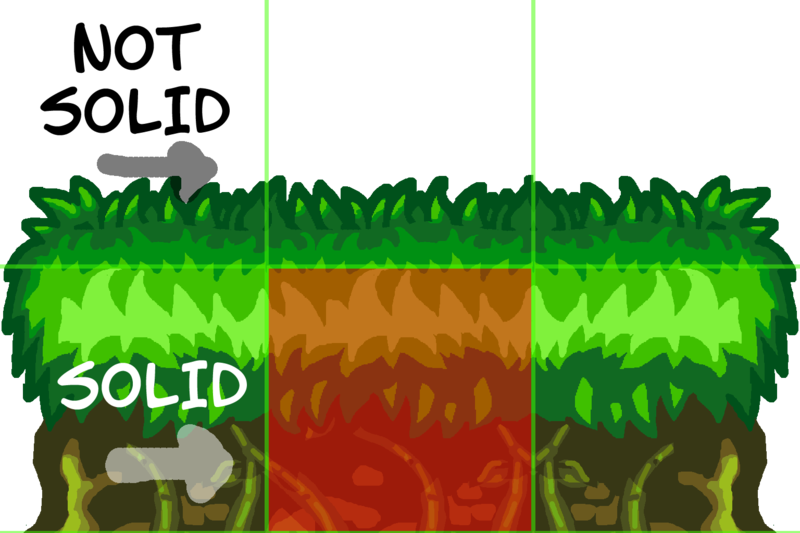 For this reason, the tiles are set up so the tile the character stands on can be completely solid for collisions, but the tile above it is completely not solid (no collisions.) This is more efficient for game tile system engines that use collisions in the actual tileset as opposed to separate objects or geometry for the collision detection of the environment. AH! I rather figured that was the intention in the art design, but the way some of the OTHER tiles were coming out when I separated them into individual sprites was resulting in some images that just seemed odd to me. That's why I was checking. But you've confirmed I was doing it right after all. Thank you again! You've been great! Keep in mind. that's the big difference between the "A" tilesets and the "B" tilesets... the B's don't have that bit of perspective showing the top of the ground. B is more "perfect side view". I definitely noticed that. I guess in my initial game dev efforts, I've been used to drawing (what might pass for drawing) in a "perfect side view". But for the project I'm on now, I'm hoping to add a sense of depth, thus my choice with "A". But your illustration and explanation helped me to better understand the thinking behind the arrangement of the tiles and so-forth.